Fleet EC00-0198-85: On display during a technical exposition at NASA Dryden are L to R: Boeing's X-37, the flight-article Boeing X-40A, behind the MicroCraft X-43 mock-up, and an actual Orbital Science's X-34 on the right. On display during a technical exposition at NASA Dryden are L to R: Boeing's X-37, the flight-article Boeing X-40A, behind the MicroCraft X-43 mock-up, and an actual Orbital Science's X-34 on the right. 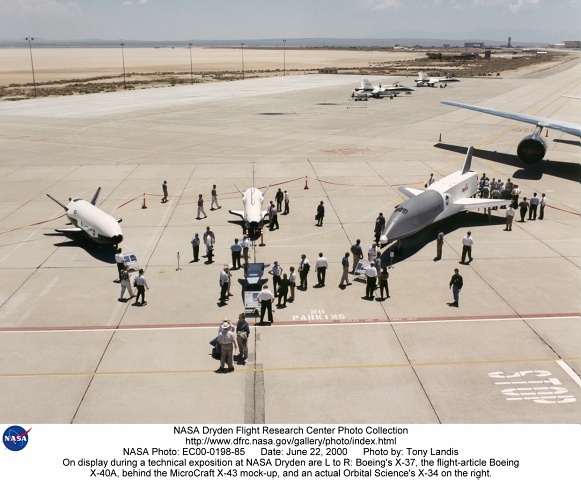 Description: Aerospace industry representatives view actual and mock-up versions of 'X-Planes' intended to enhance access to space during a technical exposition on June 22, 2000 at Dryden Flight Research Center, Edwards, California. From left to right: NASA's B-52 launch aircraft, in service with NASA since 1959; a neutral-buoyancy model of the Boeing's X-37; the Boeing X-40A behind the MicroCraft X-43 mock-up; Orbital Science's X-34 and the modified Lockheed L-1011 airliner that was intended to launch the X-34. These X-vehicles are part of NASA's Access to Space plan intended to bring new technologies to bear in an effort to dramatically lower the cost of putting payloads in space, and near-space environments. The June 22, 2000 NASA Reusable Launch Vehicle (RLV) Technology Exposition included presentations on the history, present, and future of NASA's RLV program. Special Sessions for industry representatives highlighted the X-37 project and its related technologies. The X-37 project is managed by NASA's Marshall Space Flight Center, Huntsville, Alabama.